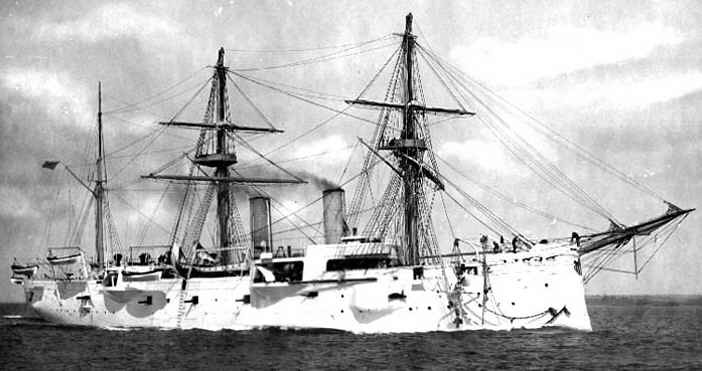 USS Chicago in early 1890s. One 5"/31 (12.7 cm) gun is just visible below the aft-most boat. U.S. Naval Historical Center Photograph # NH 61549. Bag gun later modified to use semi-fixed ammunition. Used as secondaries on Chicago, one of the "New Navy" cruisers built in the 1880s. This was one of the first steel-tube naval guns built entirely in the USA. Two guns were built. The original Mark I guns had trunnions and no liner. The trunnions were later cut off and a liner inserted, converting the weapon to fixed ammunition. At that time, the guns consisted of liner, tube, jacket and nine hoops. The hooping began 3.5 inches (9 cm) from the breech and stopped 59.5 inches (151 cm) from the muzzle. There was no muzzle bell. Used a Dashiell Mark II Mod 2 breech mechanism.